This is a personal profile of Whaddon Village created for the Living Archive course (LAC) which I recently completed. Having moved to the village three years ago I knew some minor details about the area but not enough to provide a full picture of it’s history. Following on from an internet search I started taking photographs of the village landmarks but it wasn’t until I met local villagers that I was able to learn more from them. I am extremely grateful to the proud residents of Whaddon who provided me with their extensive historical knowledge that I have documented in this profile. The village named sign is situated on the High Street and reflects its Anglo Saxon origin which means “the hill where wheat is grown”. The village is at the centre of the ancient Whaddon Chase which for many centuries was the site for royal hunting lands and is designated an area of “Special Landscape Interest”. The population census in 1712 recorded 500 inhabitants (1) not dissimilar to the 2014 census which recorded 533 inhabitants. 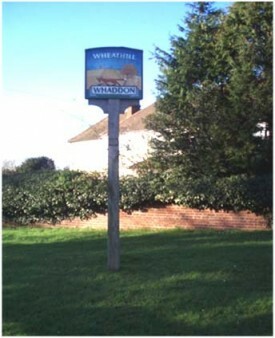 Alongside is another sign post which shows the distance between other villages in the surrounding area. Whaddon is part of the Aylesbury Vale Buckingham district with a Milton Keynes postcode. Thatched cottage The only one left in the village and is much admired for its authenticity. 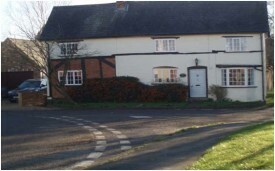 Laburnum Cottage which was previously a pub and is now a residential property across from the village green. The tree on the left of the picture has beautiful blossoms in the summer. Previously it was one of the four village pubs and was known as the Fox and Hounds. St Mary’s Church dates from the 12th Centurywith added extensions and restoration over the years. More recent the Tower was restored in 1902 and the Nave in 1906. The Bell tower has 6 bells in situ dating back to the 16th century and can be heard every Tuesday night when the bell ringers are practicing. Weddings, funerals and church services are also heralded by the pealing bells. The same can be said of the churches congregation which has declined over the years. There is a small core of people who attend on a regular basis and others who attend at special events for example at Easter or Christmas. There is one female Vicar who shares her duties with other parishes. 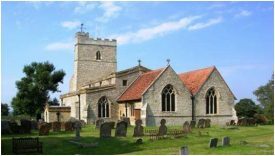 There is always fund raising activities taking place for the church throughout the year from coffee mornings, music evenings and garden parties. This helps with running costs and expenses. It can also be used as an enticement to encourage younger people to join the church congregation. 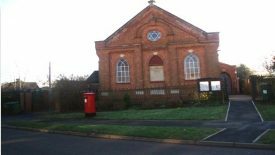 The Whaddon Chapel was built in 1898 and is described as one of the dwindling numbers of Congregational churches in Britain (1) It’s non conformist practices were introduced to the village in 1831 when it was thought the moral state of villagers were lacking. This was in contrast to the St Mary’s Anglican Protestant ideology. This is not the case nowadays as the two churches would appear to be united in their practices. Their church services are held at different times as they often share the same congregation and there are regular meetings and discussions between the church leaders. “Villagers remembered life in the village during the Second World War when evacuees from London were schooled in the church classroom. I have found that in doing this project I have discovered an abundance of information regarding the village and its inhabitants. It has been a fascinating insight into the history of Whaddon and I got to know more about the village where I now reside. Features that I once passed became more interesting and with this new knowledge I was able to pass it onto my grandchildren who now regard their village in a different light. Susan and Margaret, WI members who make delicious cakes for the Tuesday afternoon village soirées as this is where I obtained most of my information and references from my discussions with the villagers. The bell ringers stated they need new people to join and keep the bells ringing as the average age range of our current members is 65years. We need new younger members to join us otherwise there will be a silent bell tower! Villagers remembered life in the village during the Second World War when evacuees from London were schooled in the church classroom. Initially the village children were taught in the morning and the evacuees in the afternoon at the village school. It was then thought that the teaching was too disruptive and the village children were losing out. The decision to return to full time education was not always popular with the pupils.